Chris's background as a qualified teacher puts him in a unique position when working with both adults and children alike. An understanding of psychology enables him to both communicate with and command the respect of his audiences. 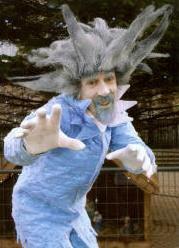 A professional entertainer since 1990. Chris has a wealth of experience to draw upon guaranteeing the success of each and every performance. Bright and colourful towering above children and adults alike. Chris is able to juggle, make balloon animals, chat and shake hands with his audience. His pleasant and humorous personality means he can create fun, amazement and command attention from a great height. People of all ages are amazed by his crazy antic on this unique cycle. An independent front wheel allows Chris to stop and chat to people at any time without dismounting. Marvel as Chris juggles a variety of objects from balls and clubs to rubber chickens and soft toys. 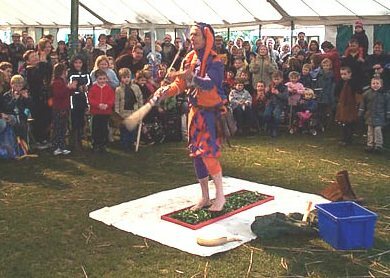 Outside venues give him the opportunity to impress crowds still further juggling with eggs, bottles, knives and fire if required. The perfect give-away item for any event... Once the first balloon animal is made, the crowds gather as if drawn by a magnet! Chris can make and distribute balloon models throughout your day.